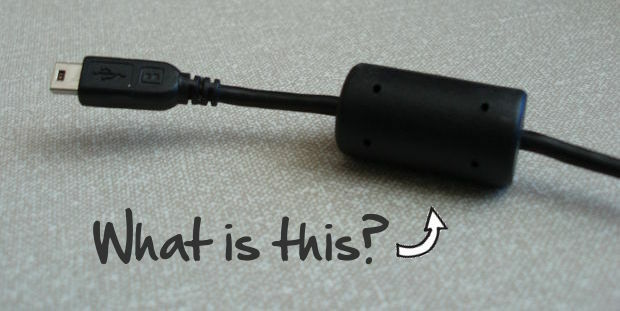 Have you noticed that some power supply cables, especially new ones like your laptop power cable has a small cylindrical thing near the pin? They are always cylindrical but comes in different sizes. A lot of people tend to think it is some electronic component at the end, but actually it is not. So what exactly is it and why is it put there? In the old times, most DC power supplies were of the linear type. That means the box part consisted of a transformer which reduced the voltage and a rectifier circuit which converted the AC to DC. You will remember them to be comparatively heavy. These were really inefficient and wasted more power. But they were electrically silent which means very low electromagnetic noise. In the modern times these got replaced with Switched-mode power supplies which replaces the transformer with a high frequency oscillator. This makes them highly efficient and light weight. The only disadvantage is the extra electromagnetic interference or electrical switching noise getting generated. The switching noise in switched-mode power supplies can be very strong. Sometimes this noise can get into the cable causing interference in the connected device. To avoid this, Ferrite BeadÂ - a chunk of powdered iron ferrite pressed into a solid ceramic type material is used. It is placed covering the power code very near to the connection point. This ferrite bead acts like an inductor blocking the high frequency (5-100Mhz) noises, so the device using the power supply stays safe.